Indoor installations no longer rely on a flat ceiling, without personality. Your ceiling becomes the center piece of your space when using planks. Custom craft work in every tin piece. Change your ceiling! Move from ordinary and let it become the center of attention of your home. Living room, office, kitchen all areas will shine. 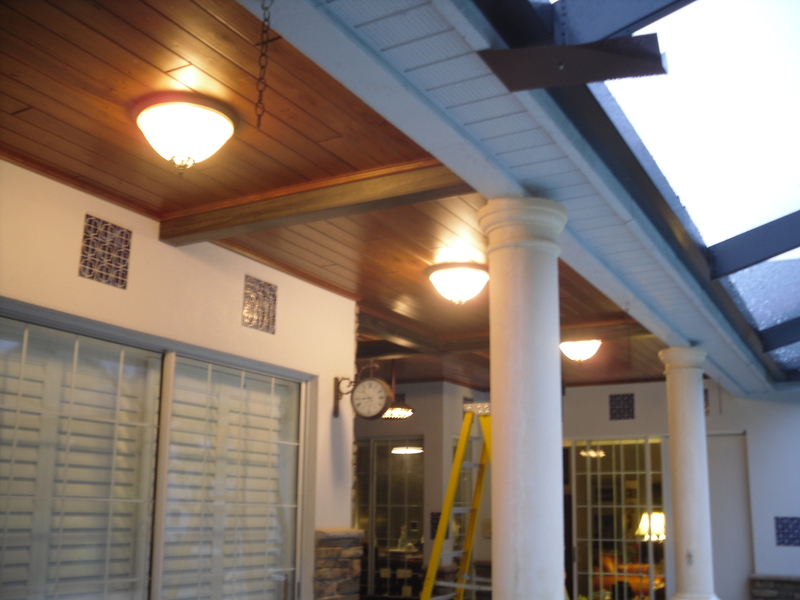 DeGeorge Ceilings - Servicing Tampa Bay Since 1953! 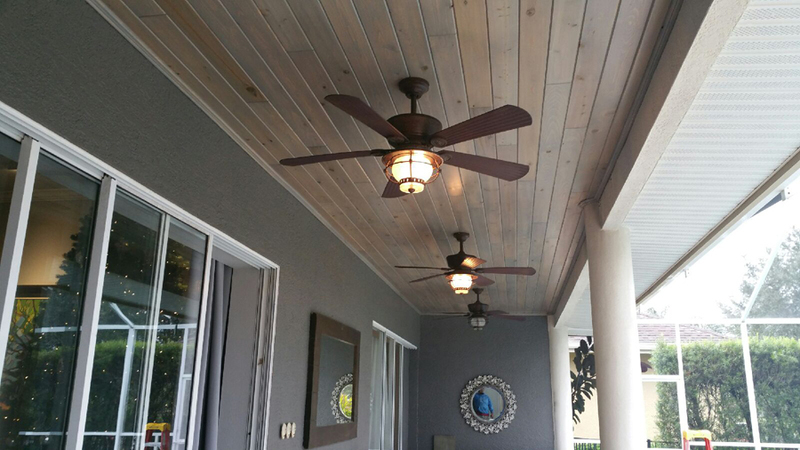 With over 65 years of excellence in customer satisfaction and being Tampa Bay's only full service ceiling, flooring, and cabinetry company, DeGeorge has maintained a reputation of the highest quality for your family. Factory direct products for your kitchen, bath, living, dining, family, great rooms, bedroom/master suite, and study. Click Here for directions to our office and visiting our BIG showroom in Clearwater. Experience the extraordinary difference a small change can make to your home. Call DeGeorge, the Room Improvement Specialist, for a FREE in-home consultation today! Each DeGeorge Tray Ceiling is designed especially for your room. 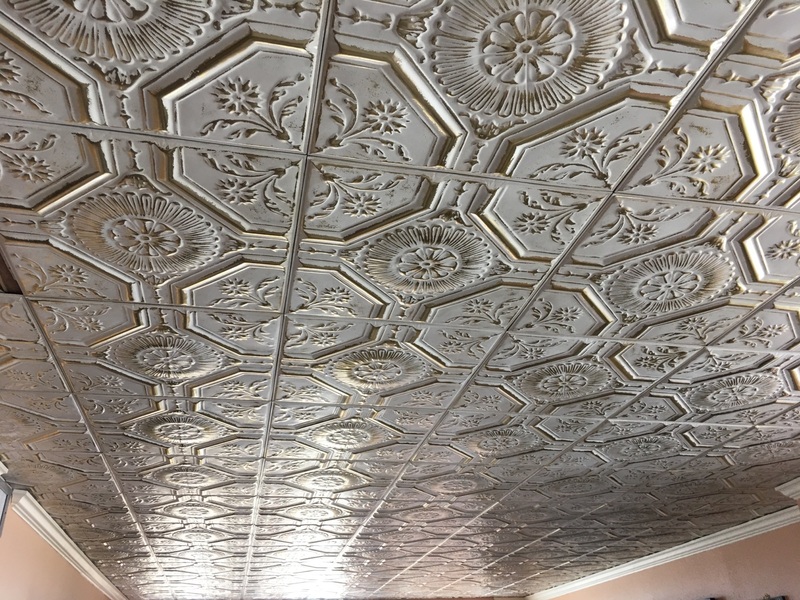 There are many options available when designing a ceiling tray including rope lighting and pressed tin. 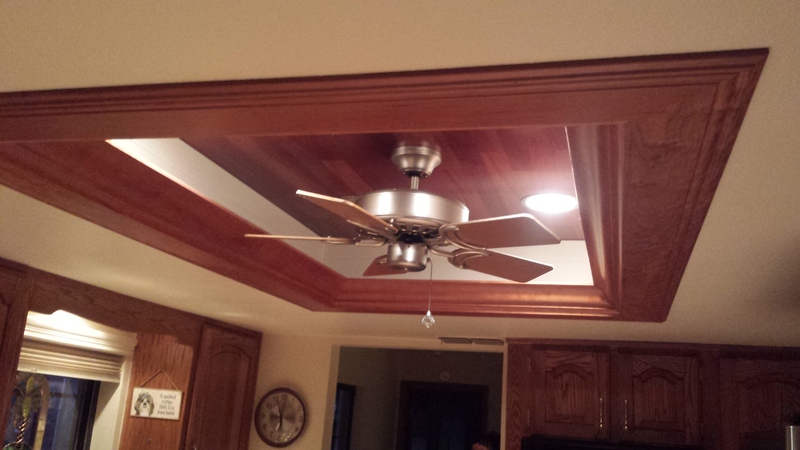 Following some samples of our custom ceilings work of local customers: Call DeGeorge, the Room Improvement Specialist, for a FREE in-home consultation today! 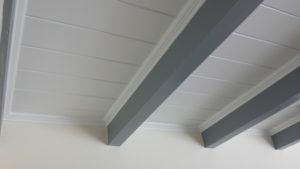 What types of ceilings do you install? From simple to elegant. 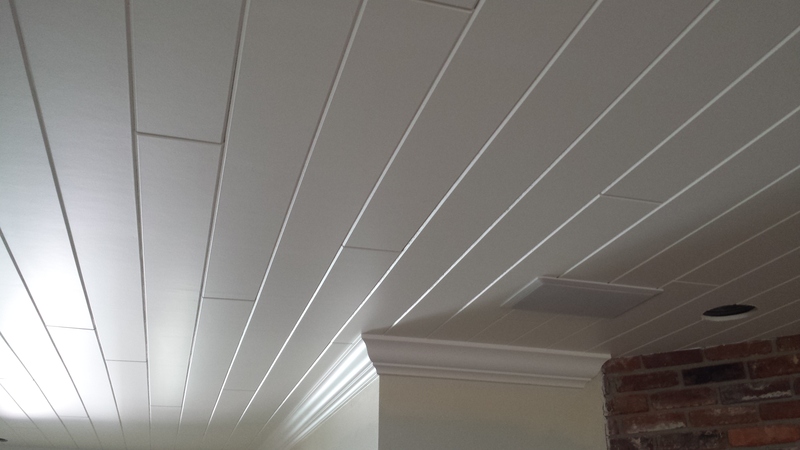 DeGeorge Ceilings has the style for you. From rich wood-grain textures to the charm of an old-fashioned tin ceiling ... there's a look for every room in your home. 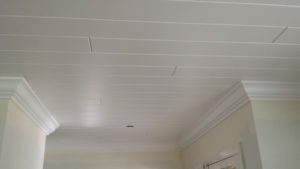 DeGeorge Ceilings cover unattractive drywall or plaster ceilings that have cracks, nail pops, stains and other damage. 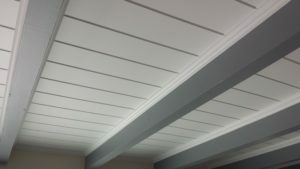 Our ceilings also have no visible grids, they reduce noise, are easy to clean and are fire- retardant. There are many different styles to choose from that would be perfect for your bedrooms, bathrooms, living rooms, family rooms and kitchens or what-ever room in your home needs that designer touch. What is an acoustical ceiling? Acoustics is usually very broadly defined as "the science of sound." The term "Room Acoustics" can be more narrowly defined as the shaping and equipping of an enclosed space to obtain the best possible conditions for faithful hearing of wanted sound and the direction and the reduction of unwanted sound. It deals primarily with the control of sound which originates within a single enclosure, rather than its transmission between rooms. In addition to reducing the undesirable background noises that originate withing a room, the acoustical objective often includes preservation of the wanted sounds. For example, any space considered to be speech or music room -- upper grade classrooms, assembly halls, or wherever we are communicating to an audience of some kind, requires faithful reproduction of wanted sound. The techniques are retention and reinforcement of useful sound reflections. In short, we control sounds for communication with reflective surfaces, and we control reverberation and background noise levels with absorptive surfaces. Can I put insulation on the back of an Armstong ceiling? 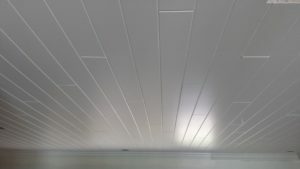 Only DeGeorge suspended ceiling panels (2' x 4') that are at least 5/8" thick can be back-loaded with additional insulation. Rolled insulation must be used and installed perpendicular to the cross tees so that the weight of the insulation rests on the suspended grid system, and there is air space between the insulation and the panel. Ask your dealer for specific details. Note: Insulation must never be placed behind fire-rated ceilings, unless designated in a UL design assembly. Backloading fiberglass panels is not recommended. What about the insulation value between floors? Most ceilings are installed between floors that are maintained at the same temperature - making insulation unnecessary. Basement recreation rooms are at least partly heated by heat flow through the ceiling from the heated space above. In that case, attempting to insulate the basement ceiling surface could actually reduce heat flow. 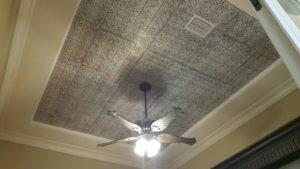 Can ceiling tile be used in the bathroom? Yes, if the bathroom is vented to the outside with a fan. DeGeorge ceilings with HumiGuard Plus are extra sag resistant for use in areas of high humidity. BioBlock paint treatment inhibits the spread of mold and mildew. 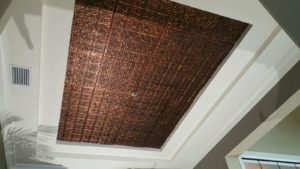 Can the ceiling be installed over embedded radiant-heat coil ceilings? No. An appreciable loss of heating efficiency will result and the ceiling will not remain stable. Can a hanging or swag lamp be used with an DeGeorge ceiling? Yes, if supported independently by an existing structural member. Can a new ceiling be cemented directly over old ceiling tiles? In many cases, the old ceiling may have deteriorated and an adequate hold cannot be obtained. Therefore, cementing over old ceiling tiles is not recommended. How much will a new ceiling cost? Not as much as you think! Costs vary according to product design and performance features. Please call 1-800-282-6237 for complete pricing. What is the minimum overhead distance required for a new suspended ceiling? DeGeorge suspended ceilings require a minimum of 3" (if installing recessed lighting, measure the height of the light and add 2") of overhead clearance. Suspended fiberglass ceilings require a minimum clearance of 2-1/2". OptiGrid™ reduces clearance needs to only 1-5/8". Can existing light fixtures be used with a new ceiling? Yes. 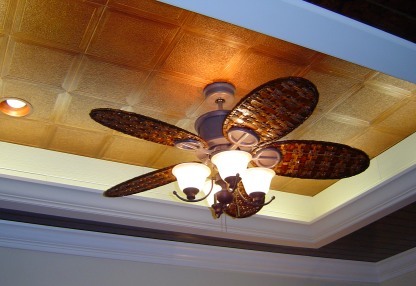 DeGeorge ceilings are adaptable to standard lighting fixtures. What kind of fluorescent lamps should be used with DeGeorge ceilings? All lamps must be rapid-start. Warm white and cool white are most efficient, but deluxe and natural-colored lamps provide a more pleasant atmosphere. How many fluorescent lighting fixtures will I need for a new ceiling? Standard rule for light fixtures is two 4' fluorescent tubes for every 75 square feet of suspended ceiling. Will the ceiling sag over time? No. DeGeorge ceilings are treated with a special back coating to resist moisture. When properly installed under the right conditions (no excessive humidity, etc. ), they remain level and flat. We recommend using HumiGuard Plus panels or fiberglass panels in areas of high or seasonal humidity; they are not recommended for spaces exposed to continuous moisture, such as shower rooms and swimming pool areas. Do DeGeorge ceilings protect against flammability? All DeGeorge ceiling panels, tiles and planks are fire-retardant and meet Class A flame-spread ratings with the exception of WoodHaven planks, which meet Class C flame-spread ratings. Where can I get product warranty information? Detailed product warranty information is included with every ceiling product. A DeGeorge representative will provide you with the warranty paperwork after installation. What brands of ceiling products do you sell? We carry Armstrong ceiling products. Armstrong is a a global leader in the design and manufacture of floors, ceilings and cabinets. Also, you will find American Tin Ceiling products in our showroom.